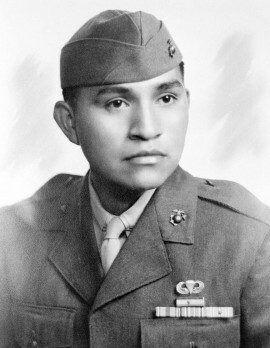 Ira Hamilton Hayes (January 12, 1923 – January 24, 1955) was a Pima Native American and a United States Marine corporal who was one of the six flag raisers immortalized in the iconic photograph of the flag raising on Iwo Jima during World War II. Hayes was an enrolled member of the Gila River Pima Indian Reservation located in the Pinal and Maricopa counties in Arizona. He enlisted in the United States Marine Corps Reserve on August 26, 1942, and after recruit training, volunteered to become a Paramarine. He fought in the Bougainville and Iwo Jima campaigns in the Pacific Theatre of Operations. On February 23, 1945, he helped to raise an American flag over Mount Suribachi on Iwo Jima, an event photographed by Joe Rosenthal of the Associated Press. Hayes and the other five flag-raisers became national heroes as a result of Rosenthal’s flag raising photograph. In 1946, he was instrumental in revealing the true identity of one of the Marines in the flag raising photograph who was killed in action on Iwo Jima. He was never comfortable with his new-found fame, however, and after his service in the Marine Corps, he descended into alcoholism. He died of exposure to cold and alcohol poisoning after a night of drinking on January 23–24, 1955. He was buried with full military honors at Arlington National Cemetery on February 2, 1955. Hayes was often commemorated in art and film, both before and after his death. In 1949, he portrayed himself raising the flag in the motion picture movie, Sands of Iwo Jima. A giant Marine figure of Hayes raising the flag on Iwo Jima is included with the other five flag-raisers figures on the 1954 Marine Corps War Memorial in Arlington, Virginia. In 1961, his life story was the subject of the movie, The Outsider. The movie inspired songwriter Peter La Farge to write the The Ballad of Ira Hayes, which became popular nationwide in 1964 by singer Johnny Cash. Hayes was portrayed by actor Adam Beach in the World War II movie Flags of Our Fathers in 2006.